Worldwide the supply of sea urchins has diminished in the last few years, from the peak landings of about 120 thousand tonnes in 1995 to the current levels of about 75 thousand tonnes. The traditional harvesters such as Japan, Chile, US and to a lesser level, Canada, have all experienced reduced catches. Russia and Peru are supplying larger quantities to the global market than they did in 1995, but no new major entrants have emerged in the last few years. The market for sea urchins is very traditional with Japan consuming about 80-90% of the total current global supply. There is a domestic market in many sea urchins harvesting countries, especially in Chile, New Zealand and the Philippines. In Europe, the market is also traditional and is mainly in the Mediterranean countries, Italy, France and Spain. Sea urchins seem to be novel and trendy and due to growing ethnic populations, small niche markets may exist in various countries, including those in Europe. There is likely an unmet demand on the Japanese market for good quality sea urchin products at the appropriate price, particularly with less current supply to the market. This may indicate options for a new entrant e.g. from the Northern Periphery and Arctic areas, if a logistic route from harvest to market can be economically established and high consistent quality product supplied. However, the value of this product will never be as high as in the European (French) market. This is due to the logistics of getting the product to Japan, the lower value placed on any imported product in this market and the need to add processing costs to product prior to selling in the market. For the NPA countries Iceland, Greenland, Ireland and Norway, supplying to markets such as France is the obvious choice; the production in France is low compared to the relatively high landings in the 1970s and 1980s and supply from other countries e.g. Spain appears small. Iceland has in the past years successfully exported green sea urchins to the French market and is currently the main supplier to the market. The overall French market appears however to be small, or estimated as 350-450 tonnes of whole sea urchins based on harvest and import figures. There may be an unmet demand on the market, assuming an appropriate selling price, as there are indications that the supply to the market has been about 1,000 tonnes in the recent past. There may be options to supply to Italy as well but care must be taken in export as a large part of the current supply in Italy may be from unlegal or unlicencesed fisheries. There may also be options to supply the apparent emerging high end restaurant niche market in various European countries such as in Scandinavia, Germany and England. Although this market may be lucrative, it is at the same time quite unpredictable when it comes to regular supply during harvest. 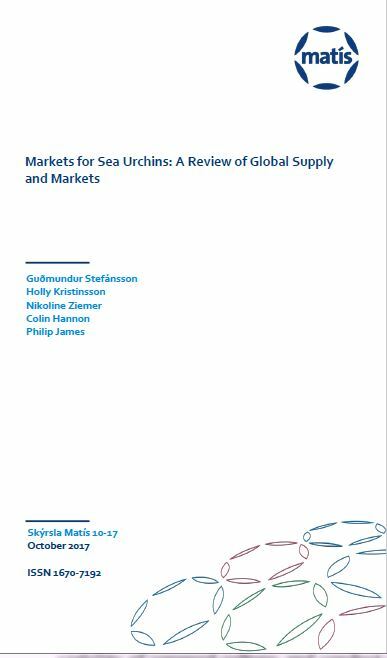 The full report is attached and the URCHIN team hope you find it interesting and informative reading.